The museum has been very busy in the last week with five school tours. 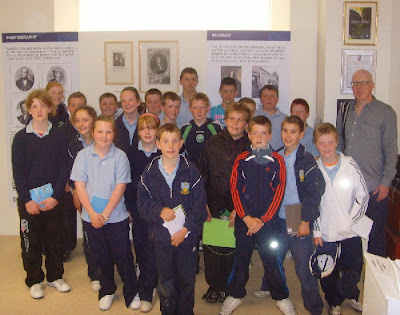 The 5th & 6th class from Knockanore were the first through the door, followed by the junior classes from Ballyduff Lower,3rd class St.Mary's Dungarvan and then we had the two groups of 6th class from Scoil Mhuire Abbeyside. The children were taken around the museum by our curator Willie Fraher and then broken into groups to view the handling area, the stereoscopic viewer,view-master and the pinhead camera. The younger pupils from Ballyduff Lower enjoyed some art work in the childrens area. The visit's were very much enjoyed by all the groups and many of the children signed the visitors book. Some of the comments we received from the children, Michael H- It's cool; Caragh- fantastic; Shane- unreal; Katie- fun.